The work done on our Church vehicle was really quite wonderful. Our members really loved the design detail. The vehicle is a moving billboard while we drive around town... the artwork spreads the message that our church wants to share with our community. MJ did a fantastic job designing the artwork, we were not sure what we needed on the wrap since this is the first time we had this done to one of our vehicles... he was able to take our few ideas and develop a great wrap for our vehicle. They worked with us on making some changes to the original design, MJ wanted us to be totally satisfied with the design since it was our vehicle and would be driving around with this artwork on it. 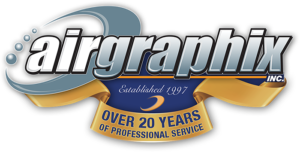 We definitely would recommend Airgraphix for anyone thinking of wrapping their vehicle. Give them a call to see what they can do for you. Every person we dealt with from the owner, Joe Calabrese to Wendy in the front office and contact person was friendly and so helpful. GREAT JOB EVERYONE!!! Fantastic people and great results. I have used Airgraphix for 3 company trucks so far. They are fast and efficient. They take pride in there work and that shows in the results. Highly recommended.